Dr. Douglas Brandt graduated from the University of Texas Southwestern Medical School and completed his internship at the Methodist Hospitals of Dallas. His residency program was finished at the Mayo School of Graduate Medical Education. He is specialized in radiologic diagnosis of conditions such as asbestosis, lung cancer, mesothelioma, and pleural effusions and is board certified in the field of diagnostic radiology. 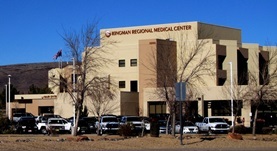 Currently, Dr. Bramdt practices at the Kingman Regional Medical Center.